On Wednesday, June 6, 2018, the Wisdom, Compassion, and Longevity: Symposium of the UC San Diego Center for Healthy Aging took place. Based on the title of the event, the theme for this year’s symposium was on the advantages of growing old. My classmates and I came to the event to represent the Life Course Scholars (LCS) Program and our HAP and NAP findings. By the time I arrived, my classmates and professors had already set up the posters outside of the Medical Education and Telemedicine (MET) Building, located in the UCSD School of Medicine. Overall, the posters looked beautiful. I can tell that we each put a lot of effort into making them appear professional, while at the same time, reflective of our hard work. My classmate, Jackie S., commented on the high level of interest that the attendees of the symposium showed towards our HAP and NAP findings. For instance, one of the attendees asked us if we had any paper size copies of each poster board to take home. Unfortunately, we did not have any copies, but Professor Bussell and Lewis agreed that this is something they will start doing next school year. Luckily, most of the attendees chose to take pictures of the poster boards, for their own personal reference. Once the second symposium session was about to begin and the attendees began leaving, the professors gathered us together to take our very last pictures as a LCS cohort. I found this part of the event to be really sad, because that’s when I realized I will no longer be able to see my classmates again each Wednesday for class. Therefore, today not only represents the last day of class, but also the last day of the entire 2017-2018 Life Course Scholars Program. In essence, this means a few of us will be graduating this school year, whereas most of us will be finishing up our last few years at UC San Diego. Overall, I’m really grateful that I got the opportunity to truly get to know my classmates and professors. Hopefully, the professors decide to create an LCS alumni event in the near future, so we can all see each other again, and laugh at the good times we’ve had together while in the LCS Program. Until next time! On Sunday, June 3, 2018, John, Jessica, Micah, and I went to our very last choir session at Seasons. Of the four choir sessions we’ve had this academic quarter, this last one has been by far the most memorable. For starters, we actually got a chance to lead the choir session [!]. Although this might sound intimidating, it actually turned out to be quite enjoyable. Micah played her Ukulele and John held up the songbook for her, since we did not have a music stand. Jessica and I passed out the songbooks to the residents and assisted them along the way. Despite having different tasks, all four of us made sure that when it came to singing, we would all sing in synchrony. When John, Jessica, Micah, and I decided we wanted to start a new choir program for people with dementia in Seasons at La Jolla, we hoped to pick songs that the residents would not only enjoy, but also recall from their past memory. 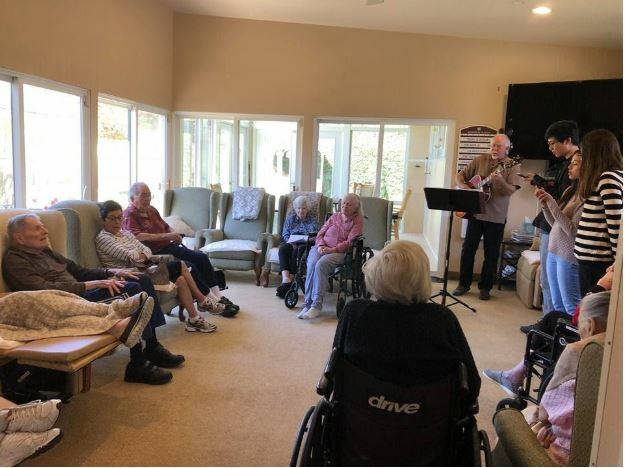 By borrowing some of the songs that Gene has been playing at Seasons, we hoped that through enough repetition, the residents would eventually feel comfortable singing along with us. After our first choir session at Seasons, Jessica made sure to print enough copies of the lyrics in large font for each song, in order to facilitate memory and encourage recall among the residents. Although we did not manage to get all the residents to sing along with us, during these past four choir sessions, we were successful at getting the residents involved in the process, while at the same time having a pleasant time. I completely agree with Cathy. The choir sessions have been quite special for me as well. Just by comparing the first session with the last, I could see a major change in the residents. At first, they were not entirely sure what our intentions were in Seasons at La Jolla. They thought we were Music Majors at UC San Diego, and were going to Seasons to practice our singing abilities. Towards the end, most of the residents realized the main reason we were at Seasons was to spend quality time with them. At the end of Sunday’s session, one of the residents even said, “Don’t leave. Come back!” When Micah explained the reason we were leaving was because it was almost dinner time, the resident said “Okay, but you should come back!” We both smiled and nodded our heads to confirm we were planning to come back. Although Jessica will be graduating this school year, John, Micah, and I are hoping to continue going to Seasons at La Jolla, after summer break comes to an end. Overall, I’m really excited to see how these choir sessions will expand in the near future, especially since future Life Course Scholars may be interested in joining us. 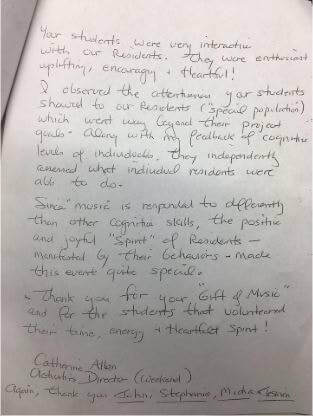 Overall, I’m really thankful for Cathy’s heartfelt letter and for Barrett’s permission to have us organize a choir program for dementia patients in Seasons at La Jolla, as part of the Life Course Scholars (LCS) Program at UCSD. Of course, none of this would have been possible without the support of our professors and UCSD's Center for Healthy Aging. On Wednesday, May 23, 2018 the LCS cohort stayed on-campus. As a class, we had a quick debrief on our experience at the LGBT Community Center in San Diego. Many of my classmates seemed to have really enjoyed the visit, and wondered why we did not go to the center sooner. According to Professor Bussell, we are not the first LCS cohort that have felt this way. For this reason, Professor Lewis has attempted to negotiate with the LGBT center previous years, in order to schedule more intergenerational activities at the center, similar to the one from last week. Unfortunately, it has been a major challenge to actually make this happen, because the center already has many scheduled events and does not have room for more. A potential solution to this problem can be to just have the LCS cohort attend the LGBT center’s scheduled events for a second or third time. In the end, this will allow students and elders to have the flexibility to see each other again and speak about whichever topic comes to mind during the next visit. Overall, I think the student and the elder will both appreciate this alternative solution very much. The reason I say this is because I felt really rushed when speaking to Richard. So when it was time to put away the tables, I used that extra time to talk to Richard. I felt guilty for not helping with clean up, but I knew Richard still wanted to get my feedback on the first few pages of his book and I too, was heavily invested in learning more about his thoughts on the book. When Professor Bussell mentioned that the LBGT Community Center was a rich and vibrant community, I did not imagine this applied to the entire Hillcrest Neighborhood. As soon as we drove into the Hillcrest’s territorial boundaries, I could feel the vibrancy in the people. It was a sunny day, and people were walking on the streets of Hillcrest, while enjoying the afternoon breeze. Unlike other parts of San Diego, Hillcrest is known for its “tolerance and acceptance.” Overall, it was hard not to notice Hillcrest’s high level of acceptance, just by seeing the LGBT and Transgender Pride Flags everywhere. When I walked into the LGBT Community Center, I felt welcomed. I actually did not shy away from talking to the elders, as I sometimes do. Perhaps because the elder to student ratio was much bigger, which made it much easier for me to talk to a couple of elders on an individual basis. I noticed there were some shy/reserved elders at the center, which also made it much easier for me to start a conversation with them. While at the LGBT Community Center, I met so many great people, including this amazing gentleman by the name of Richard. Richard goes to the center to learn more about this marginalized community. I honestly do not recall how our conversation began at the table, but we just started talking about life. At first, I wanted to know if he knew UC San Diego students from the Life Course Scholars (LCS) Program were joining them that afternoon, and if so, I was curious to know what made him want to come in the first place. Richard showed me the LCS flyer, in which he highlighted three key words: 1. Respect 2. Social Participation 3. Communication. He hoped to learn how to spread these values within his own community. Then Richard and I started talking about food. I asked if he had a favorite type of food, and he said “no,” because he likes all kinds of food. As a person who LOVES food, I agreed with Richard, but mentioned there is still a lot of new food I have yet to try. Then Richard started saying how college is a perfect time to explore and try new things, and he also emphasized the importance of living in the moment and having a balanced life. According to Richard, this was a constant struggle he had to overcome throughout his entire life, and said “even as you age, you’re still learning how to balance work, family, and fun, etc.” I found this to be very true. Unlike our last visit, I noticed that the walls in the dining room were decorated with colorful flowers and butterflies made out of paper and cloth. I’m not sure if these decorations were exclusively set up for Mother’s Day weekend, but I truly hope these decorations are left in place all month long, because they are really beautiful! In regards to the actual choir session, Gene, the hired music guitarist at Seasons, joined us for our second choir session. We sang the same songs as last time, and a few new songs. Some of the new songs that I enjoyed singing along to this time around were ‘All You Need is Love’ by the Beatles, ‘Let Me Call You Sweetheart’ by Bing Crosby, and ‘Over the Rainbow’ by Israel Kamakawiwo’ole. When we sang along to ‘Oh, Susanna!’ by Stephen Foster, one of the residents brought his harmonica and played along to the rhythm of the song. It sounded lovely! I can’t wait to come again next weekend! However, the highlighting experience from this week’s outing is that I got the chance to see new faces and speak to different elders. Mama Glo was one of the elders I did not meet last time and she was in my Learning Exchange Group (LEG) this week. I learned so much from Mama Glo’s past experiences just by listening to her speak. 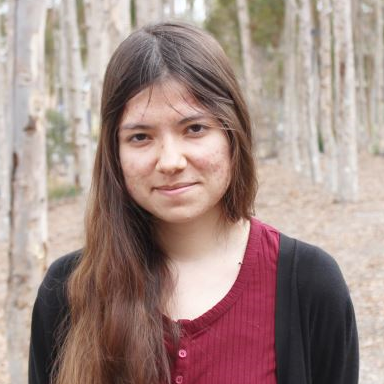 I found it very inspiring how she chose to return back to school and get her undergraduate degree at UC Riverside (UCR) after discovering she could not get a promotion at her job for not having a college education, despite being an excellent employee. She emphasized how her college years were one of the best times of her life because she got the chance to study abroad and learn about her Hispanic roots, while taking classes at Mexico. While at Mexico, she learned the importance of having a community where everyone feels welcomed and acknowledged. Although she recognizes Mexico is not the same anymore, as a result of all of the drug cartels, the idea of ‘community building’ still remains with her till this day. ​For this reason, Mama Glo’s current mission is to support the homeless at Linda Vista and make their voices be heard by the people in power. So far, she has spoken with the main stakeholders in her community, and is hoping to reach the day in which the homeless at Linda Vista will be treated with dignity and respect, and be provided with the necessary resources to excel in their future endeavors. I really do hope this becomes a reality. This week I had two major outings. On Wednesday, I went to Casa de Manana and today I went to Seasons at La Jolla. At Casa de Manana, I had the chance to briefly present my findings on the ‘Housing’ and ‘Social Participation’ aspect of La Jolla, as it relates to the World Health Organization’s (WHO) Checklist of Essential Features of Age-Friendly Cities. Afterwards, we gathered into our Learning Exchange Groups (LEGs) and Chase, Jackie, Monique, and I were fortunate enough to work with Alice and Billie. Together we created a list of essential age-friendly city features and Chase, our spokesperson, shared our ideas with the rest of the class. Now that I reflect back on this experience, I cannot help but realize that neither Alice nor Billie mentioned anything about making homes more affordable, in order to satisfy the unmet housing needs of people from all SES backgrounds. Since Alice and Billie are not personally affected by this unmet housing need, as compared to other elders, I’m not surprised why failed to mention this specific age-friendly city feature. In this week’s reading, we focused on the cultural images we have of old age. We learned how the cultural images we presume to be ‘true’ about old age are actually false. For this reason, Professor Lewis has assigned us the Debunking Ageist Stereotypes and/or Bridging Gaps of Understanding about the Aging Population Project. The purpose of this project is to counter some negative misconceptions/ stereotypes held about older people. My classmate, Jessica, mentioned last week a really creative way of doing this project and that is through the “Never Have I Ever” Game. Although I’ve never played this game before, I know participants usually sit or stand in a circle and one person says something that they have not done, and use the phrase, “Never Have I Ever…” to begin their statement. Every participant starts with ten points, but lose a point every time they disagree with a statement. The last person with points left wins the game. Throughout the game, participants are encouraged to share their experiences/ stories, but are not required. In Wednesday’s reading discussion, we focused on how the same historical event differently shapes the experiences of individuals who occupy different and unequal statuses within a cohort. Elizabeth asked the class to think of major historical events within our life span that may shape our experiences in the long-term, and the first event that came to mind was the September 11 attacks. Since the impact of a historical event on our lives is also dependent on how old we were when the event occurred, I would agree that the September 11 attack had a minimal impact on my life, since I was only 4 years old at the time of the incident. Now that I reflect back, I realize I do not have any substantial memories of the 9-11 incident. The only memory that does come to mind is seeing my mother stop her morning routine to watch the news, and my older sisters rushing to get ready for school. I somehow knew something important was being shown in the news, since my mother never behaved this way. However, I did not discover what truly happened on Tuesday, September 11, 2001 until I was much older, since my mother did not want to worry me at the time. By now, I have heard many people (including my own family) speak about the September 11 attacks, and each time I obtain greater insight about this tragedy. Nonetheless, my memory of the 9-11 incident remains the same, since it relates to my experience on that day. Through this class exercise/ discussion question, I was able to see how although people of all ages may live through the same historical events, the meanings they attach to these particular events and the impact these events have on their lives varies, based on their age at the time of the event. On Saturday, Jessica, John, Micah, and I went to Seasons at La Jolla. Seasons at La Jolla is an assisted-living facility for elders that require Alzheimer’s/ Dementia-Related Care and is located approximately 6-7 miles away from UCSD. The reason my classmates and I chose to visit this assisted-living facility in the weekend is because we have been meaning to meet Barrette Patel, the CEO at Seasons, since Spring Break. Now that we have met Mr. Patel, his staff, and residents, we are quite pleased to have chosen to do our Healthy Aging Project (HAP) at Seasons. After getting to know Mr. Patel at the personal and professional level, we discovered he is a pleasant person to work with, mainly because of his willingness to share his life lessons with us. On Saturday’s meeting, Mr. Patel primarily focused on the importance of sleep. According to Mr. Patel, high-achievers that get few hours of sleep each night are the ones that develop dementia in the long-run. Although this statement is heavily based on Mr. Patel’s observations (while working at Seasons), it has definitely caused me to question the literature, since research does show that a potential risk factor for dementia is lack of education, although many of the residents at Seasons, are highly accomplished individuals.